Maria (María Onetto) puts her heart and soul into being a good wife and mother, but her husband and family take her for granted. Even at her own birthday party she spends more time cooking and waiting on guests than she does celebrating. 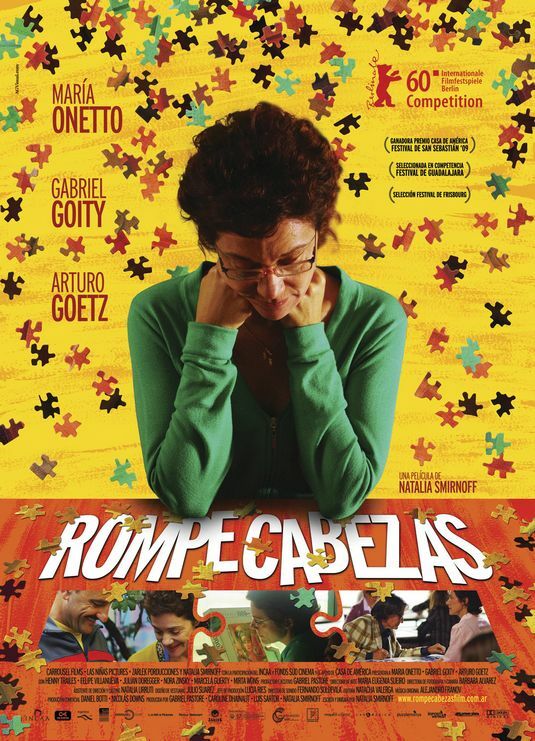 It is at this party that Maria receives a gift that will change her life; a jigsaw puzzle. She quickly discovers she has a knack for putting the pieces together quickly, and decides to pick up some more puzzles. At the puzzle store she sees an ad placed by another puzzle enthusiast seeking a partner for a tournament. Maria responds to the ad, even though she knows her husband Juan (Gabriel Goity) wouldn't approve. The other puzzle buff turns out to be Roberto (Arturo Goetz), a past tournament winner who has parted ways with his previous partner. At their first meeting, Roberto tells Maria that her style is unorthodox, but good. Maria is taken aback by this; we get the impression this is the first time anyone has complimented her in a good long while. The more Maria practices with Roberto, the greater her self confidence becomes. As she begins to feel better about herself, Maria's relationship with her husband slightly improves. At the same time, Roberto is becoming interested in Maria as more than just a puzzle partner. 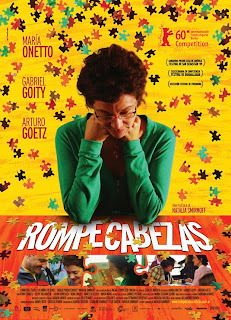 It might seem based on a set up like this that THE PUZZLE (Rompecabezas) would be headed into predictable territory, but that proves not to be the case. The puzzle competition proves to be far less important than the lessons Maria learns about herself while training, and the movie barely even shows the final tournament. Nor does the romantic conflict result in a big dramatic showdown. This isn't a movie about which man can best give Maria what she needs. Juan isn't going to win husband of the year, but he's not a complete jerk. And while Roberto offers some excitement and a chance for Maria to grow, he's not presented as some easy escape to a new and wonderful life. Ultimately it comes down to Maria getting what she needs for herself, and that's something no man can magically bestow upon her. There are some definite similarities here in plot and themes to QUEEN TO PLAY which I reviewed earlier this year. I felt that film, however, trotted out all the obvious clichés this one avoids, and THE PUZZLE does a far better job in getting across its message of female empowerment without being heavy handed about it. A lot of the difference is in Natalia Smirnoff's direction, but a good bit of credit also has to go to Onetto's believable, understated central performance. 3 1/2 out of 4 stars. Watched it last night! Really enjoyed it! Glad to hear it, Mike. I really wasn't expecting much from this one, and figured it would go down an all too predictable path, but it really surprised me.